By offering the best products and services and innovation unmatched in the industry, SIGNARAMA has maintained its position as the industry leader. 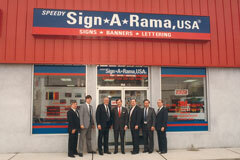 The SIGNARAMA brand was founded in 1986 by Ray and Roy Titus. Roy Titus is founder of the successful national printing franchise, Minuteman Press. Having worked for many years in the printing industry, Roy and his son, Ray, were familiar with the signage industry and realized the need for a more efficient way to purchase signage. By taking signage from the industrial facilities and warehouses to a clean, easily accessible retail space, Titus instantly made the task of sign buying a much easier and more pleasant experience. The first store in Farmingdale, NY, became an instant success. The company opened its second location in North Palm Beach, FL less than a year later. 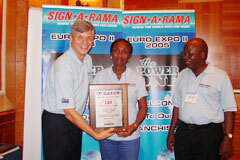 As a pioneer in the industry, there was little surprise when SIGNARAMA quickly became known as a better resource for signage needs. By offering the best products and services and innovation unmatched in the industry, SIGNARAMA has maintained its position as the industry leader. Our commitment to quality and advancement has solidified our spot as the “#1 Sign Franchise” for eight consecutive years by Entrepreneur magazine. With more than 200 employees working from offices in five countries to support more than 850 locations around the world, our size allows us to coordinate international projects using multiple SIGNARAMA locations and still provide superior service on smaller local projects in the communities we serve. We are an international corporation with a small town dedication to service. Our commitment to the advancement of the signage industry and providing a better sign buying experience for our customers has led to years of working with the best vendors and suppliers in the industry. Through our relationships with these suppliers and the role we have played in the development and testing of new products and equipment, SIGNARAMA has remained at the forefront of technological advancements for the signage industry. This translates into state-of-the-art software, equipment and materials we use to create signage that is not only ahead of the curve, but ahead of your competitor. At any one of our more than 850 SIGNARAMA sign centers around the world, a team of experts will work closely with you to understand your company’s image and then translate that into signage that will help your company make a lasting impression. 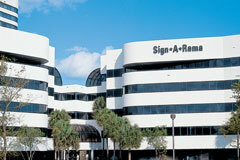 For more than 20 years, SIGNARAMA sign centers have been the premier full-service sign center for all signage needs.